Home › Dating & Relationship Advice › Early Signs Relationship Advice: Notice How Your Partner Treats People! Early Signs Relationship Advice: Notice How Your Partner Treats People! How does he treat the wait staff at the restaurant at which you are dining? Is he respectful, considerate and understanding of that person? Or is he demanding, impatient and snappy? Yes, everyone has had a bad day once in a while; however, he really should not take it out on others who are serving you. How does she treat her family members? Does she have a good relationship with her parents, brothers and sisters? Does she make an effort to keep in touch at least monthly? Yes, I know there are understandable exceptions to this rule for why someone would not involved with a family member and you will have to ascertain whether he or she has a valid beef with that family member. How does he talk about his ex’s? Does he blames the break up entirely on his ex and takes no responsibility for any of the breakup? That’s a huge red flag. Run right away! You may be his next ex that he bad mouth! Does she make sarcastic, cutting comments about other people? Sarcasm is a form of humor, but it is also a way to put someone else down to make them feel superior. Constant criticism or put downs is a red flag that if you get on the wrong side of this person, you will be their next target! Does he buys the best of everything for himself (technology, cars, vacations, homes) and is very stingy when it comes to gifts for others? Does he seem to have a sense of entitlement for himself and others (including you) can do with second best? These are the red flags that I recommend you watch out for when you are starting to date a new person on a consistent basis. Most of my clients are looking for understanding, considerate, respectful, caring and generous people to date. My relationship advice is that you do deserve to have a person who offers you those qualities at the very least. So if you see some of these red flags, then you will have to make a decision about whether you can continue to date this person or move on. Have you experienced these behaviors in a current or past relationship? What have you done when you did come upon these red flags? This curious relationship coach would love to know. Please leave a comment. www.TalkwithCoachAmy.com and fill out my form and we will have an exploratory conversation about how coaching can help you reach your —relationship and life goals! 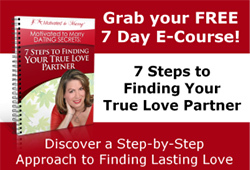 ‹ Where on your to do list is finding a serious romantic relationship? Wow, this is so true! I was always told when I was young and dating that I should watch how the guy treated his mother because that is how he would treat me. Does he treat her with love and respect? Does he talk behind her back and criticize? It is so important to take these things into consideration. You are so right on Coach Amy. I hope that your post will help people take notice early on so that they don’t get themselves into a long term relationship that is harder to let go of later on. I’ve been very fortunate in my relationships that I never ran into a situation where my guy talked negative to or about anyone. But I can definitely agree that this is a huge red flag! I totally agree!! I feel that sometimes we over look clear signs simply because we are in awe of the person and the excitement we are feeling being with a new person. So these tips are very very important. I also pay attention to how he treats his family members. This to me shows his values. Because eventually I and our children will be his family. good points!! thanks for pointing this out.